The Elvis Files Magazine Issue 10 by Erik Lorentzen. Elvis Is Alive: The Complete Conspiracy by Xaviant Haze. Elvis Presley Movie Posters Book by Greg Lenburg. The Elvis Files Magazine Issue 11 by Erik Lorentzen. Elvis Presley - From St. Paul to Fort Wayne by Joe Tunzi. Around the Bloch! by David English and Pål Granlund. 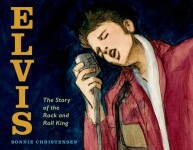 Elvis: The Story of the Rock and Roll King by Bonnie Christensen. The Elvis Code by Orkun Akinci and Michiel Houdijk. Released as a catalogue for the exposition "The Elvis Code" in the Breda's Museum, which ran from 6 March to 28 June 2015. Elvis: The Birth of Rock and Roll by Alfred Wertheimer. The Elvis Files Magazine Issue 12 by Erik Lorentzen. Change of Habit by Pål Granlund and David English. Elvis Has Left The Building: The Day the King Died by Dylan Jones. Elvis & Ginger: Elvis Presley's Fiancée and last love finally tells her story by Ginger Alden. A Touch of Gold Lamé by Erik Lorentzen. Taking Care of Elvis by Letitia "Tish" Henley Kirk. Elvis, The Best of British - The RCA Years 1959-1960 by Trevor Simpson and Pål Granlund. The Elvis Files Magazine Issue 13 by Erik Lorentzen. Elvis, Behind The Legend by Trina Young. Elvis, We'll Remember You by Ed Bonja. Elvis, An Army Trilogy, Volume II by Andreas Roth. Elvis by Philippe Chanoinat and Fabrice Le Henanff. 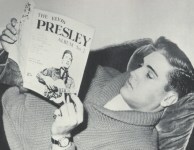 Elvis Aaron Presley, Der Mann und Sein Leben by Peter Echevers. The History of Blues & Rock n Roll Featuring Elvis Presley by Therlee Gipson. The Elvis You Didn't Know by Donnie Sumner and Ed Hill. The Elvis Files Vol. 7, 1974-1975 by Erik Lorentzen. Sam Phillips: The Man Who Invented Rock 'n' Roll by Peter Guralnick. 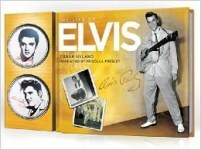 The Definitive Vinyl Artwork of Elvis Presley: 1956 - 1977 by Joe Tunzi. The Elvis Files Magazine Issue 14 by Erik Lorentzen. A Guide to the Australian Records of Elvis Presley : The Vinyl Years 1956-1990 by Glenn Reimer and Peter R. Hayden. The Life Of Elvis by Frank Hyland. Elvis, A Personal Memoir by Chris Hutchins.